Take 1 cup water and add to your mixer. Add honey, olive oil and yeast and then set aside for 5 mins to activate yeast. Add flour and salt to a bowl and stir. Add the flour to the yeast mixture and kneed in the mixer till forms a soft ball then pour onto counter and knead till dough is smooth 5-10 mins. You could also use your mixer to knead the dough for about 4 - 5 mins. Set in an oiled bowl and cover with plastic wrap. Let it rise for 1 hour. 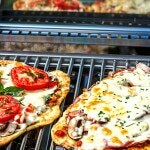 Heat the bbq on high then when its hot, turn to low before placing the pizza on the grill. They should only take a few minutes and when u have nice grill marks, flip and cook the other side for 30 seconds. While your dough is rising, make the sauce. Chop the onions and garlic into chunky pieces. Throw into a pan with the olive oil and sauté till almost tender. Then add the tomatoes, spices and salt and pepper. Simmer till most of the liquid is out and the sauce had thickened. Cool slightly and start making your pizza. Take the cooked shells off the grill. Add the sauce and your pizza toppings. We like a little cheese, then toppings and then more cheese! Turn 2 burner to med heat and turn 2 burners off completely. Place the pizzas on the side with no direct heat and close the lid to create an oven. Cook till cheese is nicely melted.